As people in Saudi Arabia are usually dressed either in black — for women — or white — for men —, I usually try to appreciate the moments when I’m abroad and enjoy the colorful clothes people wear, spending much of my free time walking down the streets and observing others. That’s why I was glad to see my friend Faiza Ambah elegantly profiles Saudi fashion designer Yahia al-Bishri, the man who put color back in menswear here. His boldness also inspired others like Siraj Omar and Lomar Thobe to redefine the traditional Saudi garb. However, and from what I have seen, it seems that young Hjiazi men are embracing the new trend more than their counterparts in Najd, which is to be expected as people in the central area are more conservative. Although I only wear a thobe occasionally as I prefer my casual outfit of jeans and t-shirts, I personally like the idea of updating the thobe with new styles and colors, and I plan to get myself one of those cool Lomar thobes in the near future. The problem is that they are relatively expensive, as their creators admitted, but I think it is worth getting them for special occasions. How about you Saudi boys and girls? What do you think of those new cool thobes? Yay or Nay? This Post was posted in Design, Saudi Arabia and tagged fashion, lumar, lumar thobe, menswear, siraj omar, thobe, yahia albishri. Bookmark the permalink. I love the new colors and styles, but what about the ghutra? Does that match, too? However, I hasten to add that I’d prefer to see the traditional white for men and black for women, in Makkah and Madina, in order to remain mindful of our underlying unity in the eyes of Allah. Personally, I never wore thobes after high school except on occasions. 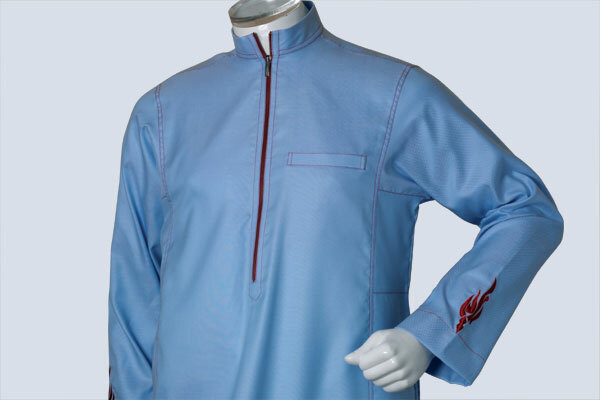 But now with the new styles and personalizations of thobes I tend to wear them more often. And I totally agree with you, a Najdi friend of mine admitted that he thinks that those new thobes are “low class” and for “tarsh al ba7ar” .. Mind that I’m quoting and I’m not to blame .. I was just thinking the same thing about colored & fancy thobes yesterday when I passed by a thobe shop. I do agree that some of them are very nice and unique.. but others are so bold that u’re put in some momentary shock when u see them (although i think that’s what the person who wore it intended to do :P) and other are truly UGLY!! oh yes, I’ll get one but not now because they are so expensive !! 500 – 600 SR !! I think very few people will buy them. looks like u wanna get one for eid, u should. Look, when it started a few years ago, only Yahya and a few other shops made them. The workmanship was excellent, but the styles varied from absolutely beautiful, to bad… now the styles have gone from bad to horrendous, especially that the cheaper places make them and the workmanship is bad. in the end it all depends on personal style and the taylor. um, NO! sorry, maybe its because its something new and i have to take time to grasp it… but so far in the two minutes that i am exposed to this new thob i really am not a fan of it. Definitely yay. I think they look great as long as the colors and designs are modest and minimalist. and you have to have a certain attitude to carry them off. I think it’s one of those outfits that may look absolutely great on some people yet incredibly ugly on others. I love Lomar designs. Very stylish. cool hehe… always looking for ways of differentiating my thobes from the rest :) thanks for sharing. The new casual Thobe trend has been running in Hijaz since late 2006, and YES I love the change, am gonna get a collection of those soon. I LOVE thobes. absolutely love’em. and i’m not even a saudi! by the way why are saudi thobes so body hugging? hello-! that’s not allowed in Islam for guys! Nah, I don’t like it. I prefer the old traditional white , I personally think wearing the white thobe and shemagh are perfect combination. What about bisht? Does anyone know where I can get them? I mean not designer bisht, just the average one worn by Sheikhs. Lomar is indeed pricey, plus their quality has taken a hit of late. It seems they are not able to cope with the huge demand. I tried them twice (9 thobes in total). Wasn’t satisfied. As a muslimah of non-arab country, men wearing thobe and ghutra always amaze me. just to make it short. i’d still go for the old ones. Too much designs & colors; sooner or later there won’t be any difference between men & women! My husband would go for the thobes in the tones beyond sparkling white for sure…but he would stay away from the crafted embroidered designed ones..too girly he says! I took a look and yes, some of them look like abayas with all the bling! I love the idea of making the thobe more interesting. women are creative with their 3abayas so i don’t see why men shouldn’t be either. my only concern is that some men will want to take their creativity a step too far and end up with tacky designs. so guys, if you’re going to wear them, make sure the thobes are tasteful and still have that elegant look that the classic white thobe has. And sure, you can get an abeya with trim or stitching on it, but it is still black. Why not some color in abeyas, too? Guessing that won’t happen for sometime – not until women are driving – which I doubt will happen in the remaining years that I spend, here. I have never seen a Thobe in real life and now I cant figure out why. After researching what a Thobe was I now would like to get my hands on a well made white thobe. I can find some awesome occasions to wear one. can anybody help me with some links for saudi online shops specialised in thobes and by that i mean thobes made just for Saudi Arabia? Please! Thank you! For people in the West seeking modest traditional clothing I would suggest the web site “Halalapalooza.com”. They link with many other web sites around the world, including Saudi sites, that offer clothing and many other products. I personally have done business with many of them and although I am a careful shopper, I have never been disappointed in either the service or the products that i’ve purchased. Enjoy! I am from UK Birmingham and I want to buy Jubba Thobes and perfumes off you from your shops, Direct, and delivered to me in large ammount. Please contact me and give me some sort of price list insha’Allaah. Al Noor garments, Jeddah, Saudi Arabia. Those look like something to wear around the house. If the end result is a thobe you cant really wear to work or to do business in or to visit an official government office or court, then what’s the point of the thobe? Keep those for camping trips to the desert or the beach and rest assured they will never catch on with the public because they don’t do their job. A definite nay nay for me. I’d wear vivid shirts & the occasional jeans all right, but the fanciest thing I’d do with my everyday thobe is a somewhat slim fit version. Come to think of it, my comment came in a few years post publishing this article, so maybe I’m lagging behind?